Well we did it! We opened up our doors in Portland! Right off the bat, we got cruising on projects–before we even had time to buy toilet paper or a coffee machine (essentials)! 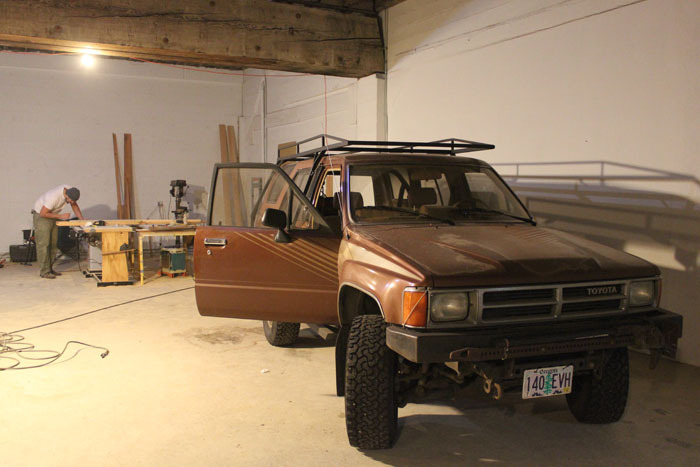 Pete and Brian pulled their trucks into our space, unloaded their tools, and got cracking. The first project was building a booth for Hydro Flask (www.hydroflask.com) for the Winter OR Show in Salt Lake City (www.outdoorretailer.com). Hydro Flask wanted a giant half hot/half cold mountain for displaying their insulated portable Hydro Flask bottles, two small banner stands fashioned out of oak branches, a “Hydro Pub” for serving hot and cold water, two split log display racks for bottles and a 12 foot tall metal armature for supporting giant Hydro Flask banners. We had 16 days to complete this project and deliver it to the show in Salt Lake City–so as you can imagine, the table saws were blaring from the get go. This project included re-claimed wood products, spray foam, CNC’d metal, ingenuity and lots of creativity. Because of the hard work of Brian and Pete–the project was completed on time and the work is being delivered to the show AS I WRITE THIS POST!! We hope Hydro Flask loves their booth! Check in soon for more news from FAB PDX!! This entry was written by brian, posted on January 21, 2011 at 8:21 am, filed under News. Bookmark the permalink. Follow any comments here with the RSS feed for this post.